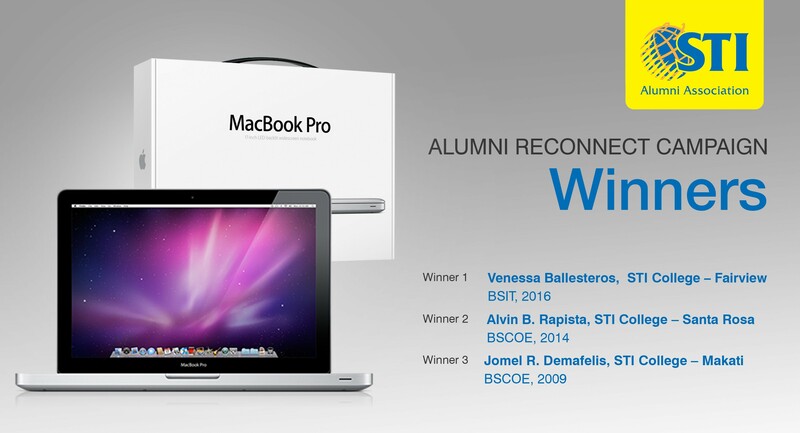 Held at STI College Oritgas-Cainta, STIAA Trustee Ms. Jo-riz Salandanan and STI Vice President Dr. Lloyd Bautista awarded three alumni winners with a MacBook Pro. Venessa Ballesteros, BSIT graduate of STI College Fairview batch 2016, Alvin Rapista, BSCOE graduate of STI College Santa Rosa batch 2014 and Jomel Demafelis, BSCOE graduate of STI College Makati batch 2009. With a total of 2,318 validated alumni registrants from different campuses nationwide, the winners were drawn electronically last February 13, 2017. Headed by STIAA Trustee Janina Jayme and validated by an SGV representative, Roxanne Urmeneta. Other witnesses present were STIAA Cubao Chapter President Czar John Panganiban, STIAA Shaw Chapter Officers namely Joven Alegria, Ray-ann Rodriguez, Noreen Faye Madera as well as Alumni & Placement Officers from STI College Marikina and STI College Shaw, Ronessa Posadas and Katherine Duran respectively. The Alumni Reconnect Campaign is a program of the STIAA to entice our alumni to reconnect with their alma mater by updating their contact details and employment information. The campaign ran for six (6) months, from August 1, 2016 to January 31, 2017.